We will call this meal our Labor Day weekend American red meat indulgence. 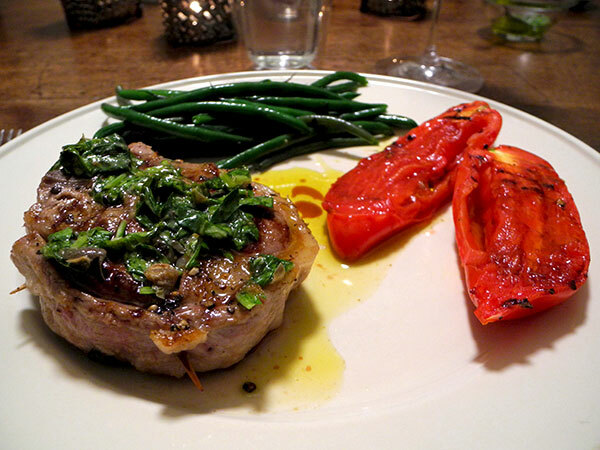 These were among the tastiest and best-butchered and trimmed lamb chops either of us can remember ever having. The Ottomanelli brothers on Bleecker Street are a priceless treasure. I bought four of them yesterday, and put two of them in the freezer for another day. 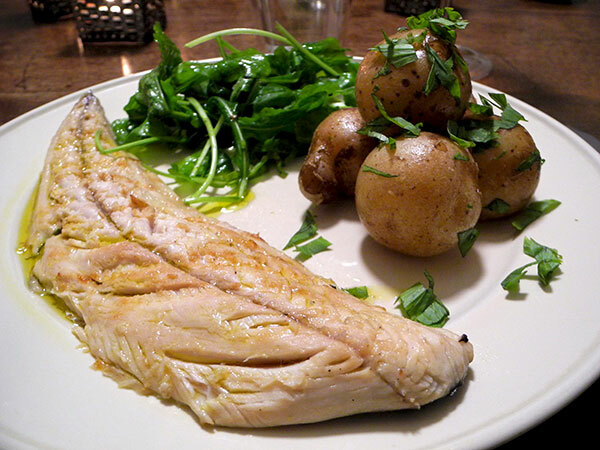 This mackerel fillet was marinated, flesh side down, for thirty minutes in a mixture of wine vinegar and water, parsley stalks, thinly-sliced red onion and lemon, and a tablespoon of sugar, heated and cooled (it was gorgeous; I wish it could have come to the table!). 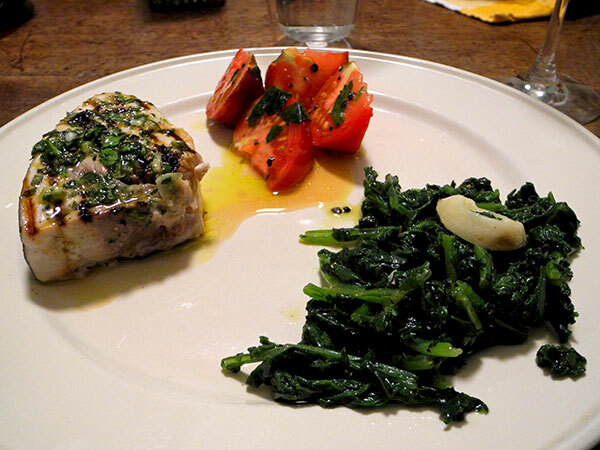 The mackerel was then removed from the marinade, patted dry, brushed with olive oil then pan grilled over a high flame. The flavor was great, but I still felt the fish was missing something in its taste (and appearance), even though the recipe asked for nothing more. I’m thinking at least chopped parsley, or another herb, sprinkled on top, or maybe something tomato. A spot of something red on that plate would certainly have made it more exciting. 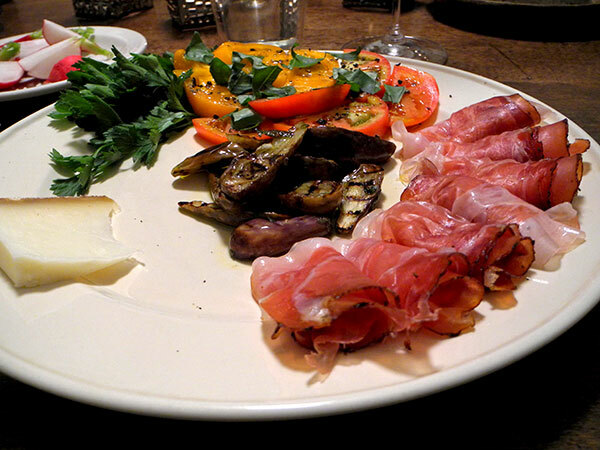 While I’m critiquing the presentation, I should definitely have sliced those wonderful, sweet Désirée tomatoes into halves before bringing them to the table, sprinkling the lovage on then. It’s what we call a picnic; it’s our at-home hot weather meal of last resort (although because they’re such a pleasure, it’s sometimes very much a first resort, independent of an evening’s temperature and humidity levels). We sit at a wooden table next to an open window which looks out onto the roof garden, but there are no bugs. It may take a while to set out the fixings, but there’s no heat involved (except in the unusual case of last night’s meal, which involved grilling tiny eggplants), and there’s very little washing up afterward. There’s also no lugging of picnic hampers or insulated wine bags. 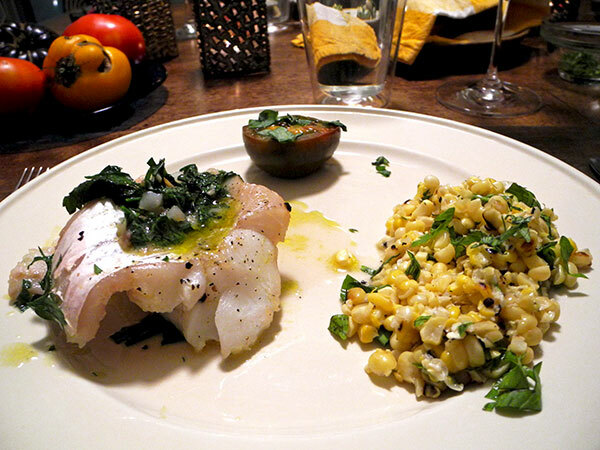 Hake with green sauce is apparently a Basque staple, by many accounts, but grilled corn is not a traditional accompaniment. Maybe if Columbus had gotten to the new world a little sooner?